This time of year, candy floods the store shelves. If you have younger kids, you’re probably thinking about putting together Easter baskets, what to add in, and of course reminding yourself not to go overboard. 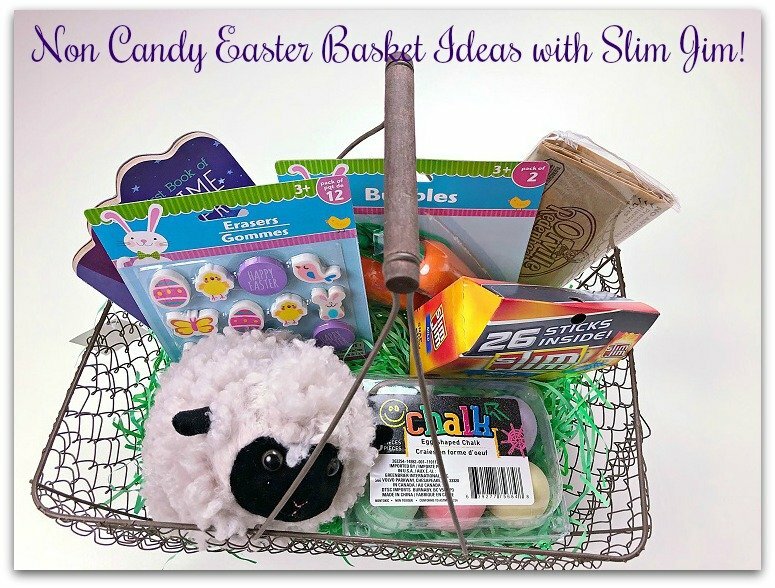 I have some great Non-Candy Easter Basket Ideas with Slim Jim, if you’re looking to stay away from sugar-laden Easter baskets this year. Even better, check out the #Sweepstakes you can enter below when you create your own virtual Easter basket with Slim Jim! You can find several size packs of Slim Jim at your nearest Walmart. 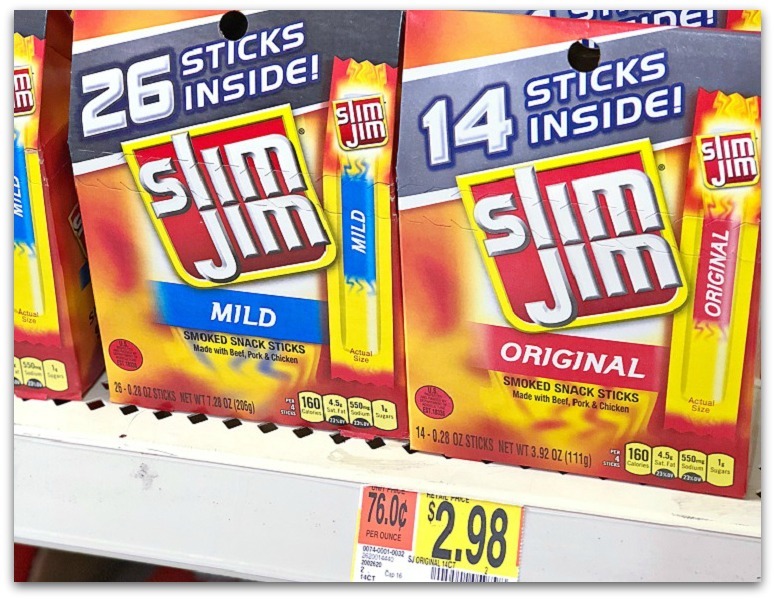 Look for these small 14 ct packs for $2.98, or the Slim Jim Original Smoked Snack Sticks, 26 ct, for $4.98. 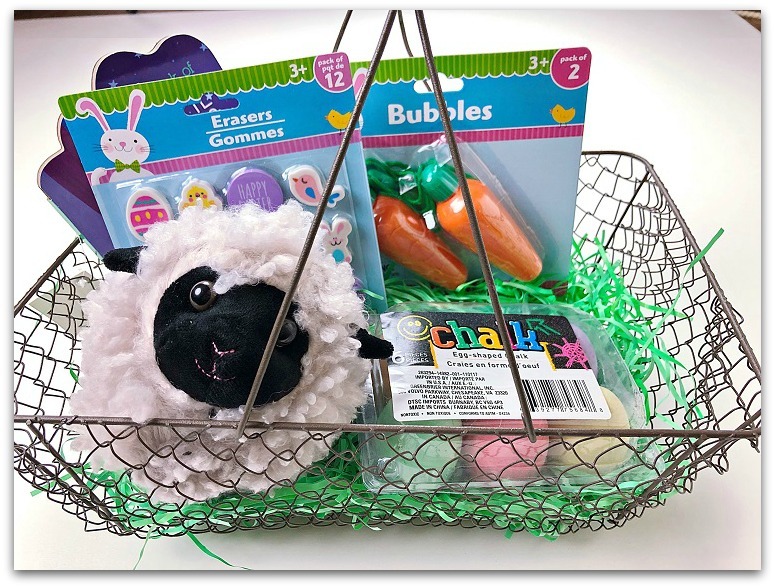 The non-candy Easter basket I created below included erasers and bubbles, a fun plush, and sidewalk chalk (such a fun thing to include since we can finally get outdoors more this time of year)! My basket in progress. You can also find coloring books for under $3 at Walmart! If I’m giving an Easter basket to someone outside the family, such as relatives or children at church, non-candy items are often my go-to. Especially on Easter Sunday itself, kiddos have often been into the candy already and the last thing mom or dad want is more sweets and a sugar crash later in the day. 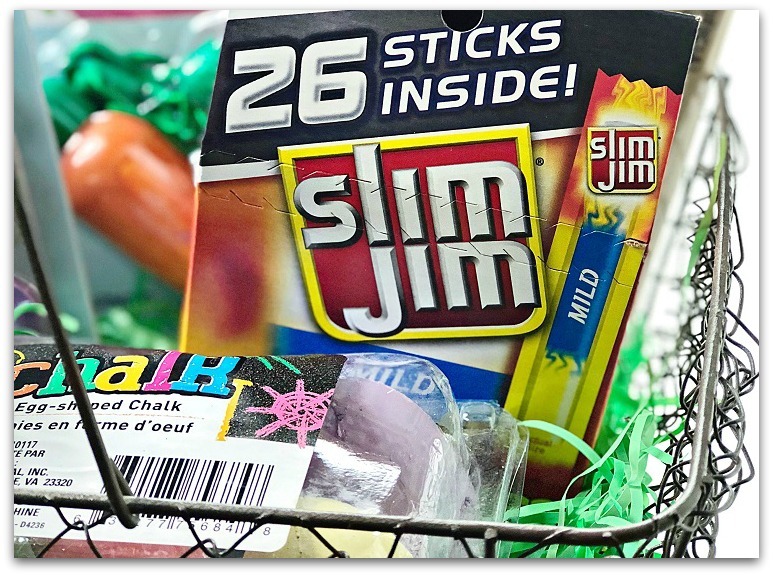 Slim Jim offers a non-candy snacking option. Other non-candy ideas are Fiddle Faddle, Orville Redenbacher’s popcorn, Boom Chicka Pop (a favorite of mine), DAVID Seeds, Crunch n Munch, Jiffy Pop, and Snack Packs! You definitely don’t have to feel limited to candy for Easter. If you love Sweepstakes like I do, head over here to enter the Sweeps and build your #SlimJimEasterBasket. 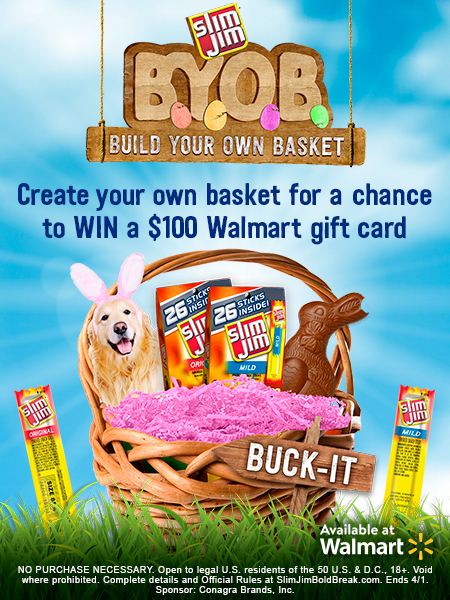 In order to enter into the sweepstakes, create your own virtual Easter basket with Slim Jim. Then, you can share on your social media for a chance to get extra entries, and increase your chances of winning. You do get (1) additional entry for each of your followers who signs up through your link. Come back to enter here daily for a chance to win one of (20) $100 Walmart e-gift cards! (5 winners will be awarded each week). Sweepstakes ends 4/1/18. Thanks for reading. If you’re a winner be sure to let the Consumer Queen team know!